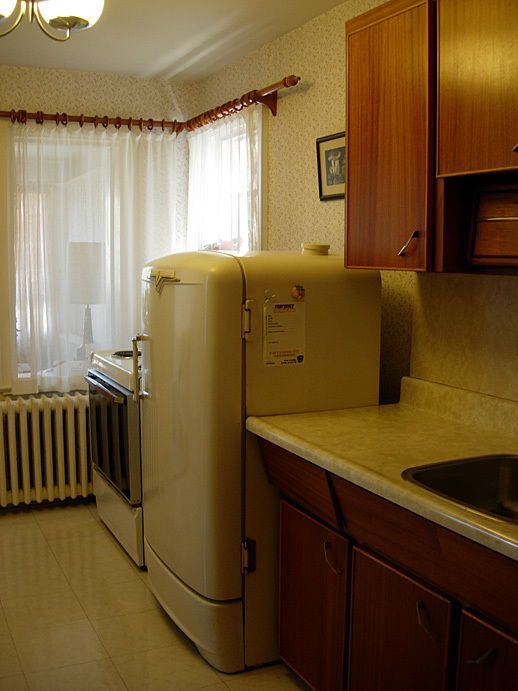 That was our kitchen on the day we took possession of the house – a week and a half ago. We already knew we’d be renovating the kitchen. 4 sq ft of counter space just won’t work if one actually cooks in one’s kitchen. Unfortunately the amazing fridge didn’t stay with the house. Probably not a bad thing, since it probably uses more hydro by itself in a month than we currently do. 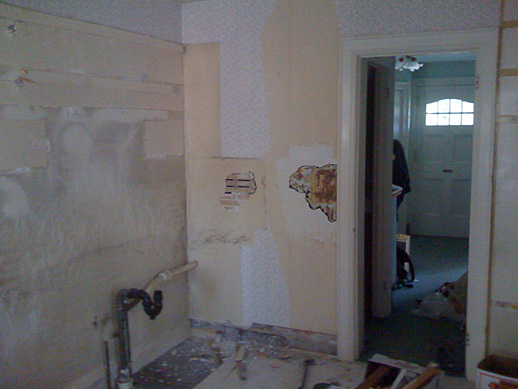 At first we started by stripping the wallpaper. We figured since we were keeping the walls more or less intact, this was the right course of action. 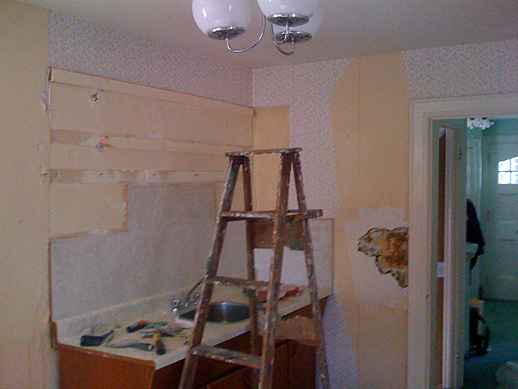 Of course, fate decided differently, and when we were about 50% of the way around the kitchen, I discovered the old lino backsplash, which had been smoothed with plaster, then painted, and finally wallpapered over. Peeling it off is not an option (see the patch beside the door in the photo below). But the cupboards came down, with only a minor amount of drama. We saved what we could, which largely meant keeping the doors. The rest was buried under so many layers of paint that they unfortunately came out in small pieces. And we started on the floors, by stripping the white lino tiles and the plywood underlay. I type this in one sentence, but I have a second to add: 10,000 nails. It all came up, revealing the amazing fluorescent green underneath, and eventually the original grey lino tiles and another layer of plywood underlay. So we started peeling that up. This proved incredibly difficult and time consuming, but we’ve got about 75% of the floor down to the original subflooring. 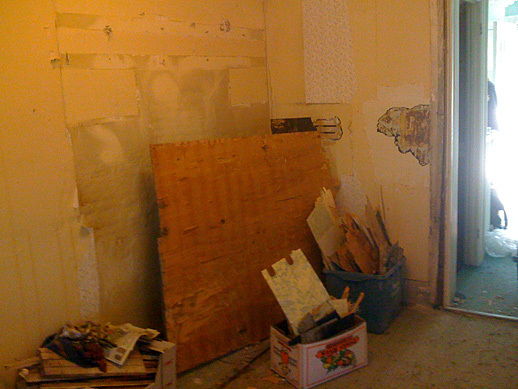 Next step is the remainder of the tile/subfloor removal, and then the exciting bit – taking the plaster and lathe walls and ceiling back to studs so the outside wall can be insulated, the wiring and plumbing moved, and new drywall installed. These are the joys of home ownership!